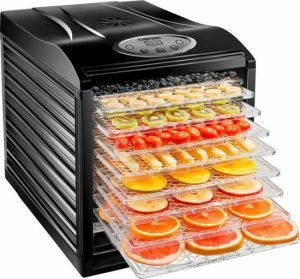 Best Buy Deal of the Day is this CHEFMAN 9-tray dehydrator for only $99.99 with Free Shipping – save $100! Dry and preserve your own fruits, vegetables and meat. Nine large BPA-free trays maximize airflow for even drying without overheating. This Chefman nine-tray dehydrator has digital temperature preset ratings from 95 to 158 degrees Fahrenheit and a countdown timer for up to 19.5 hours of heating.